Let's face it. Sulkies have a hard life. Think about your current sulky's. Are they worn out? Why?What’s your sulky made of? Commercial mowers aren’t constructed like homeowners mowers, so why should sulkies be made that way! In the rugged world of commercial mowing there’s no substitute for “good ol” heavy-duty steel. Our superior designs and state of the art manufacturing using extra heavy-duty components assures the longest life possible from your investment. Important: Use of the DM-1 or SM-1 Sulkies are not suitable for use on the Scag Pro V mower. The heavy duty steel foot platform is extremely durable, while its large size and raised tractkion dimples assure a safe and comfortable place for the operator. Build in "Roll Limiter" allows the sulky to follow ground contours during normal mowing operations, yet prevents the foot platform from rolling all the way over. Becaurs axles are supported at both ends (unlike stub axles), most all the bearing and wheel problems ocmmon with other sulkies have been virtually elimated, and no more bent axles. Casters turn on extra heavy duty 7/8" thrust bearings which dramatically reduce friction and assure years of smooth operation. Single piece whels with centered hubs, which are welded to the wheel on both sides, have proven much stronger and less troublesome than multi-piece wheels. Tubeless tires can b plugged on the spoi without disassembly of the wheel to patch an innertube. Many factors affect the operations of a sulky. Terrain conditions such as slope, ground type, ground moisture, etc. are all factors. The mower being used to pull the sulky is obviously a major factor. Generally, the larger the mower, the less effect the sulky will have on the mower's operation. Operator weight and operating style also have an effect. Proper mower setup such as tire pressure, deck pitch/weight balance and drive adjustments become very critical. We recommend a minimum mower size of 48" (preferably with hydro drive) for the Bull Rider sulky. Although operation is satisfactory on smaller mowers the factors above should be carefully considered. The Bronco Rider sulky can be used behind most 36" and larger mowers with excellent results. It is the user's responsibility to make certain the sulky suits the mower on which it is installed. 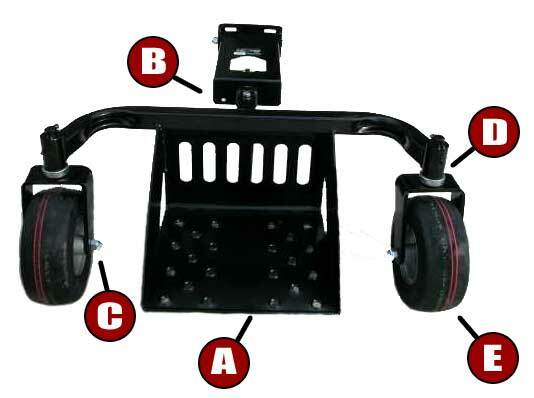 A mounting bracket which attaches to the lawn mowers motor frame connects the sulky to the mower.